At one point or another, we have all found ourselves watching animals play. Whether in a video or our living room, we watch animals playing alone, with their siblings or as animal odd-couples; this is often a means of distracting ourselves from our own work or the “real world” of politics and international news. But, what if we could learn something significant about human politics from watching animals—and specifically animals at play? 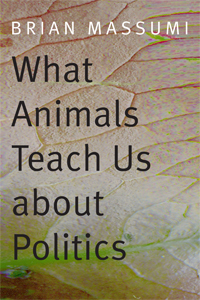 Brian Massumi tackles precisely this question in What Animals Teach Us about Politics. Starting with a challenge to both common conceptions of nature as chaotic, and a Hobbseian notion of the “nasty, brutish, and short” lives of animals (qtd. in Massumi 1), Massumi asks: “What would animals teach us [if we knew how to listen and observe well]?” (1; original emphasis). Drawing from Gregory Bateson, Henri Bergson, Gilles Deleuze and Felix Guattari, Gilbert Simondon, and Raymond Ruyer, Massumi’s extended thought experiment constructs the concept of an animal politics. Difference, specifically, the coming together of differences, is the best starting point for thinking about the human in relation to the animal continuum. Massumi’s conception of an animal politics requires the placement of the human back into the animal continuum, which dismantles some of the most foundational “differences” between humans and animals. While those of us within animal studies or critical animal studies might find that Massumi points to understandings of animal life that are already familiar, he provides a valuable philosophical vocabulary to discuss the contours of animal life. Further, his analysis of anthropocentrism and the construction of a human politics that learns from animals at play would be particularly helpful for people within human-animal studies. This review parses Massumi’s bold confrontation of the anthropocentric constructions of language, thought, creativity, and anthropomorphism, and explores what these confrontations allow him to accomplish in this book, as well as its implications for human and animal life. Think, for a moment, of two wolf cubs playing. How does their game begin? Where is the line that differentiates between playing and fighting, and how do they communicate this difference to each other? Potential answers to these questions, which signal the complexity involved in animal play, inspire Massumi’s vision of animal politics. Following Bateson, Massumi highlights the necessary elements of style and value, abstraction and condition that make play “the staging of a paradox” (2). In the arena of play, the logics of combat and play embrace each other reciprocally without having their differences erased; “they are performatively fused, without becoming confused. They come together without melding together, co-occuring without coalescing. The zone of indiscernibility is not a making indifferent. On the contrary, it is where differences come actively together” (6). The beauty of animal play lies in “its logic of mutual inclusion” (6). In this zone of indiscernibility “combat and play come together—and their coming-together makes three. There is one, and the other—and the included middle of their mutual influence” (6; original emphasis). Massumi returns to the role of paradox in this deconstruction of play, explaining it through the difference between nipping and biting. The nip, which is similar to a bite but without the intent and force, communicates the desire to play, but when an animal nips, “the gestural statement ‘this is not a bite’ contains the implicit metastatement ‘these actions do not denote what they would denote’” (6-7). Of course, Massumi clarifies that the wolf cubs do not explicitly say anything. Rather, their language works through gestures. This activity points to a difference between humans and animals whereby humans “experience paradoxes of mutual inclusion as a breakdown of their capacity to think, and are agitated by it. […] The animal, however, is less agitated than it is activated by them” (7). By placing humans on an animal continuum, we might move beyond our fragile anthropocentric “vanity regarding our assumed species identity, based on the specious grounds of our sole proprietorship of language, thought, and creativity” (Massumi 3). One of Massumi’s goals is to problematize anthropocentric ideas about language. Bateson argues that our usual assumptions about evolutionary order and language get it wrong: metacommunication does not come after denotative communication. When the wolf cub communicates (with a nip) that this is not a bite, she enacts metacommunication, and this mobilizes both cubs into action. Whereas denotative communication refers to language, by recognizing metacommunication in animals, Massumi argues that, “in fact, ‘denotative communication as it occurs at the human level is only possible after the evolution of a complex set of metalinguistic (but not verbalized) rules’” (8). More clearly, he says that animal play and its languages facilitate human language. Instead of thinking that human language exists on a unique, superior linguistic level, Massumi posits that “animal play creates the conditions for language” (8). If what we observe in animal play is a preverbal language, or “linguistic avant la lettre, […] why then shouldn’t the opposite also be the case: that human language is essentially animal” (Massumi 8)? By drawing connections between human and animal languages, Massumi begins to take down the common construction of human language as an extraordinary example of what makes humans human. Pushed a little further, he invites us to consider humor and its metalinguistic connections to animal play, asking why we can’t “say that it is actually in language that the human reaches its highest degree of animality” (8)? With such assertions, Massumi reverses the foundational human-animal language hierarchy, elaborating on the extent of this reversal in the chapter “To Write Like a Rat Flicks Its Tail” in which he positions language as the most intense form of Deleuze and Guattari’s concept of becoming-animal. Along with rethinking language, conceptualizing an animal politics leads Massumi to complicate the idea of animals as purely instinctual. He looks to the field of ethology and the concept of sympathy to loosen the view of animals—and nature more generally—as aggressive and unthinking. By deconstructing instinct, Massumi illuminates the vibrant, creative, and thoughtful lives of animals. In order to show how variation and improvisation muddy ideas about instinct and animals, he addresses the idea that animal play operates as a mode of learning. If we follow this line of thought, animal play becomes important only insofar as it can resemble forms of combat. Of course, playing does play a role in learning, but Massumi argues that animals’ abilities to improvise and express an abundance of “stylistic excess” (12) in play prove that the relationship between play and combat is not premised on the subordination of the former under the latter. The stylistic excess, or “-esqueness” (12) of play refers to the flourish of a gesture that communicates that it does not stand for what it might in a different context. This excess is what communicates to the wolf cub that “this nip is not a bite.” This “power of variation” reshapes the form of the gesture, creating “a margin of maneuver” between the play action and the fight action—the nip and the bite—which ultimately “opens the door to improvisation” (12; original emphasis). The ability of play to invent and reinvent itself shows that it is not exclusively tied to honing adaptive, survival behaviors, although the power of variation certainly helps to avoid predictability when fighting or evading predators. Reinvention and variation lead Massumi to rethink animal instincts. “If the instinctive act,” he explains, “were as it is reputed to be—a stereotyped sequence of premodeled actions executed by reflex in the manner of an automatism—then instinct would be incapable of responding to chance changes in the environment” (13). If animals’ behaviors were in fact slavishly tied to their “animal instincts,” and if instinct could not improvise according to conditions, then their actions would inevitably become predictable. Variations in animals’ lives, from their environments and climates to who surrounds them, “must be matched by variation. This requires a certain creative plasticity” (13). In other words, Massumi insists that, “instinct is sensitive to the relations between the particular elements composing the lived situation” (13). He traces Darwin’s observations of earthworms where he saw behavior that showed clear “evidence of ‘mental power’” (14), and uses this to demonstrate that “instinct is not limited to the automatic repetition of a reflex arc triggered by an inherited memory trace” (14). Rather, Massumi prompts us to “consider this power of expressive mentality to be the leading edge of evolution” (14). Without improvisation and intellect animals would not be able to adapt to their changing environments and it is not their inherent ties to instinct, but rather their plasticity that drives evolution. The improvisational ability of animal instinct, for Massumi, is most clearly exemplified in Niko Tinbergen’s concept of the supernormal and supernormal stimuli. Supernormal stimuli is an exaggerated or unrealistic version of stimulus that has an already-known response. For example, in Tinbergen’s famous study of instinct, which observed the standard stimulus-response reflex of instinct, he looked to herring gull chicks to determine which stimulus would trigger the most enthusiastic feeding response. Under normal conditions, a red dot on the mother bird’s bill was thought to be the feeding trigger for the chicks. But, Tinbergen found that the farther the stimuli that he constructed was from the realistic version of the mother’s bill, the more enthusiastically the baby birds responded. He intended to isolate the exact factors that were essential to instinctive behaviour, but he found instead that the further the stimulus was from its realistic, normal representation, the more enthusiastic and stronger the animals’ responses were; he determined that instinct “has an inborn tendency to surpass the normal […] It is animated by an immanent impetus toward the supernormal” (15; original emphasis). Unable to pin instinct down to a few properties, he noted “a pronounced tendency of instinctive activity to favor what he called ‘supernormal stimuli’” (Massumi 15). Tinbergen concluded that instinctive behavior “did not in fact depend on any isolatable property” but rather is better understood as being “irreducibly relational” (16; original emphasis). Additionally unable to make sense out of the animals’ tendency toward the supernormal, Tinbergen reduced the capacities of the baby birds he was testing to one seemingly simple word (written with irritation): “somehow.” For Massumi, “it is precisely the ‘somehow’ of this accomplishment of baby birds to frustrate the learned expectations of the scientist that needs to be retained and integrated into our notions of animality” (16). Whereas Tinbergen was agitated by his observations, Massumi is activated by this “somehow.” Massumi’s ability to pick up the strands of observations that others have dropped and to attend closely to the ways in which animals confound us results in a dense but elegant philosophical revelation of the creativity of animal life to surpass the given. Massumi’s eloquent challenge to anthropomorphism here is invigorating. Taking this risk willingly allows him to open lines of thought that are often withheld from animals. “Is it not,” as Massumi asks, “the height of human arrogance to suppose that animals do not have thought, emotion, desire, creativity, or subjectivity” (51)? What lines of thought might be opened up by starting from an understanding of animal existence as thoughtful, emotional, creative, and sympathetic instead of instinctual, nasty, and brutish? Massumi’s conceptions of animal politics, language, creativity, and sympathy culminate in the final chapter of What Animals Teach Us about Politics: “The Zoology of Play.” Massumi begins this chapter by discussing the zoo and captivity, moving through an interrogation of human spectator’s reactions to captive animals, and ending with a careful exploration of sympathy and what it means when children pretend to be animals. “There was never a child who did not become-animal in play,” he explains “the project of animal politics: to make it so that the same could be said of adults” (89). His attention to the “frivolous”—and in fact he insists that “the political animal does not recognize any rigid opposition between the frivolous and the serious” (40; original emphasis)—confronts the boundaries of what we deem valuable or invaluable objects of inquiry and effectively blurs clean human-animal distinctions. Ultimately, Massumi presents us with an animal politics that is thoughtful, creative, and sympathetic. By welcoming animals into “the meanders of philosophy” (2), he uncovers a politics that exists outside restrictive lines of thought that see difference as an end point. This book has the power to germinate in our thoughts, to make us think about and live differently with animals. See Frans de Waal’s article “What I Learned from Tickling Apes” for a detailed description of how the fear of anthropomorphism stunts scientific observations of animals. Nandini Thiyagarajan is a PhD Candidate in the Department of English and Cultural Studies at McMaster University. Situated at the intersection of animal studies, Asian American studies, and intimacy studies, her research centers on the multiple roles of human-animal intimacies in Asian North American literature.